Um, wtf kind of review is that? So as an Iranian-American, I was very excited and proud of A Separation's Golden Globe win back in 2012 (although the film, to me, is mind-blowingly depressing to watch. But it's a lovely and well-made film, and the actors are amazing.) Anyway, it happens to be on Starz right now, and I decided to check its ratings on Rotten Tomatoes and stumbled across this...rather un-insightful and unnecessary review: "Strange country...strange culture..."
LOL, wut?! That's what you got out of the film? Like, why is it necessary to even write that? If anything, and maybe it has to do with my own biases as an Iranian emigrant, the film shows us that regardless of our nationality or culture, humans go through the same life struggles; we're all fundamentally the same. 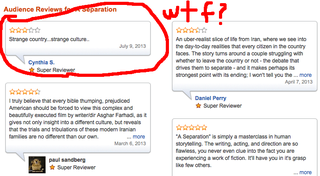 The review below the one I circled seems to be getting across that same point.